In his recent video release of Sean’s Favorite Photoshop Techniques, Sean uses the TKActions V6 panel to duplicate a smart object layer to make unlinked smart objects. This allows the smart objects in these layers to be independently manipulated to achieve different results on the different layers. Because unlinked smart object layers can be so useful, I programmed this as the default for the “Duplicate Layer” button on the Combo/Cx modules when it is used to duplicate a smart object layer. For anyone used to using the V6 panel who has gotten used to this behavior, it’s easy to forget that unlinked smart object is NOT the default in Photoshop. The Photoshop keyboard shortcut to duplicate a layer, CTRL/Command+J, produces a linked smart object instead. So does the menu command Layer > Duplicate Layer… In the video below, Sean goes over the difference between linked and unlinked smart objects. It’s a bit complicated, but an important distinction to keep in mind when working with smart objects. Personally, my use of duplicate smart objects is similar to what Sean shows in the video to double-process a single RAW file. That’s why the default for the “Duplicate Layer” button is to create unlinked smart objects. Hope you agree with this choice and will give this feature a try if you’ve not already done so. I recently finished watching Sean Bagshaw’s new video course, “Sean’s Favorite Photoshop Techniques,” and have written a review below. For those familiar with Sean’s videos, it will come as no surprise that the series is very good. I am pleased to be able offer this course on my Panels & Videos page, and Sean says I can give readers a 15% discount code. Here it is: Bagshaw15. Enter that code in the PROMO CODE field in the shopping cart to save 15% when purchasing this item. (NOTE: If you are a previous customer of mine, I likely sent you an email with an even better discount on Tuesday or Wednesday, January 29 or 30. If you missed it, please check your junk/spam folder. Contact me if you can’t find it. Include the email address you used for your previous purchase, and I’ll privately email you the other code.) Sample videos can be viewed here. The review below will give you an idea of what to expect from the new series. Sean Bagshaw has put together another excellent video course focused on the Photoshop workflow. 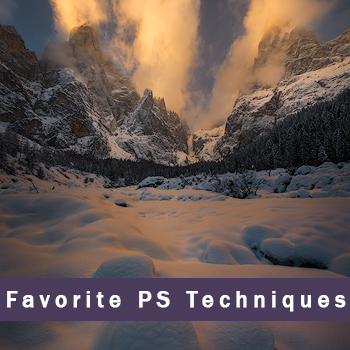 “Sean’s Favorite Photoshop Techniques” covers a lot of territory, but instead of concentrating on developing just one image, like in his other recent courses, this one takes a closer look at several different methods that can be used on almost any image. He explores these techniques in a way that helps you understand how he’s able to achieve the rich color and perfect balance that characterizes his images. These are broken down into chapters that show multiple ways to achieve a specific image developing goal, like color-grading, tonal balance, and midtone boost, to name a few. And while this isn’t a sequential image developing workflow course, my sense is that the chapters are more or less arranged in a start-to-finish order. The early chapters will generally work best near the start of the Photoshop workflow and the later chapters will be more relevant near the end of it. While I consider myself pretty adept at Photoshop, I once again realized I still have a lot to learn after watching all these videos. For example, color-grading with hue, saturation, and lightness isn’t really part of my workflow, but I can now see the advantage of using it near the start, maybe even in LR/ACR as Sean demonstrates, to set the overall color foundation for the image. I’m also thinking of trying to do more with split toning after watching the videos to see what it might add to my landscapes that have a wider perspective. Not surprisingly, luminosity masks are a powerful tool in Sean’s techniques arsenal, and he makes good use of them in the Exposure and Tonal Balancing chapters. Luminosity masks aren’t just for exposure blending, and Sean shows the many ways they integrate into the workflow to create the right balance of light and contrast throughout the scene. And, while this video series isn’t a course on how to use the TKActions V6 panel (Sean also shows the menu commands called by the panel’s scripts), it’s obvious watching Sean work that the panel can play an important role in the creative process by short-cutting many Photoshop functions and by providing a rapid method to create, modify, and deploy the necessary luminosity masks. Sean is very familiar with the panel, uses some of its advanced features in the videos, and shows how it improves workflow efficiency. The Light Sculpting section is probably my favorite part of the course. It starts off showing basic and advanced burning and dodging and how it can be used to reveal the contours of light in the scene. The “Digital Light Painting” chapter, however, takes these concepts to an entirely new level. The image Sean had been using to demonstrate different burning and dodging techniques is totally transformed into a completely new image with this light-painting process. Sean describes it as “re-imagining the light,” and it is indeed this and much more. It’s also a challenge, I think, to look deep into your images and find a personal light in them that only you, as the individual photographer who took the picture, can see. Sean shows what’s possible when you engage in this re-imagining exercise and does a great job explaining how to do it. It’s up to you to decide how far you want to take it. The last two chapters in the Light Sculpting section cover vignettes and spotlights, and this also had a lot of new info for me. Sean shows how this process can be much more than just making the edges of the image darker or the interior lighter. Many of the techniques discussed in the previous chapters are put to use. Color balance, brightness, contrast, clarity, and various adjustment layers are all employed to enhance the light in order to focus the viewer’s eye. The last section of the vignette/spotlight section is essentially another digital light painting demonstration. It’s nice bonus to get to see how this magic works again, and the results are equally impressive the second time through. Don’t expect to absorb everything in these videos all at once. Sean’s teaching style has the perfect pace, but these videos are information-dense. They cover a lot of ground, and you’ll likely want to work along with him on the practice images for some of the less familiar concepts. I can almost guarantee you’ll learn several new and very useful techniques while watching this course and practicing along with Sean. Hopefully you will also discover how to find some new light in your images as well. By the end, you should be better equipped to express the art and beauty you find in photography. I recently acquired a new Epson SureColor P800 printer. My old printer had started to leak from the print head. I primarily use Moab Lasal paper with a luster finish, so I went to the Moab website to find a color profile for the new printer/paper combination, and was pleased to find that one existed. I loaded it on my computer and did a test print. The color match to my monitor looked great. There was a problem, however. The print seemed dark and heavy overall because the shadows were blocked when viewed in ambient room light. Looking at the print under a brighter light source, I could still see the shadow separation that was apparent on my monitor, so it hadn’t been lost entirely. It just wasn’t printing well. I don’t normally view my prints under strong “gallery” lighting and want them to look good even in ordinary room light. So based on this initial test, I would need to find a consistent way to lighten them. The fact that there was NO color shift in the print meant that the profile I installed was doing a decent job in that important category. Brightness was the only thing that required adjustment. I experimented with a few more prints that had Curves and Levels adjustments added to the sharpened image, but these ended up with obvious shifts in contrast and color saturation. I then decided to see if a luminosity mask could help. Since the image’s dark values were blocked, a Darks-series mask would be a good place to start. But how to use it? Curves and Levels adjustments hadn’t worked, so I needed an alternative for that also. In the end, I decided to still use an adjustment layer, but instead of adjusting the properties for the layer, I simply changed the layer’s blend mode to Screen, which lightens the image, except for pixels that are completely black. Sharpen the image using the normal sharpening method. 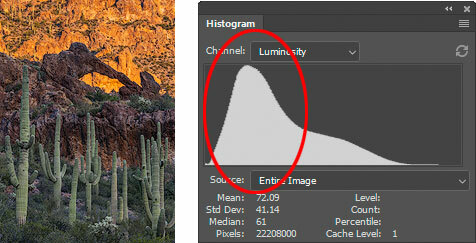 Create a Levels (or Curves) adjustment layer at the top of the layer stack above the sharpening layer(s). Set the adjustment layer’s blend mode to Screen. Apply the Darks-1 luminosity mask created in Step 1 as a layer mask to the adjustment layer. Lower the layer’s opacity to between 25 and 50 percent. The image below shows the final layer stack with the print adjustment layer on top. Not hard at all, and my image now matched my monitor in color, contrast, saturation, and brightness. In retrospect, this is sort of an obvious solution. The darks were blocked and Darks-series masks specifically targets these dark values. Screen blend mode is also a somewhat obvious choice since it provides an automatic, consistent lightening adjustment that keeps 100% black pixels 100% black, so there is a bit of a black anchor for the blackest blacks in the image. Screen blend mode also seems to lighten with less contrast and/or saturation shift that sometimes accompany adjustments to Curves and Levels using the Properties panel. So the overall effect was to create an automatic lightening effect restricted to just the dark, blocked tones in the image. Subsequent tests showed that the optimal opacity of the added adjustment layer ranged from zero to 50 percent. It turns out that the value is easy to predict based on image’s histogram. For images with prominent areas that are very dark or completely black, an opacity setting of 50% is needed. For images where there is plenty of dark colors, but still excellent detail in these dark colors, an opacity of 25% works well. This histogram shape is common with many of my images, so an opacity setting of 25% is frequently my starting point when making test prints. For images that are composed almost entirely of midtones and/or highlights with very few dark values, no adjustment is needed. There are essentially no dark values that are getting blocked in this situation, so the adjustment isn’t necessary. While a custom profile might have been an alternative to consider, the fact that the colors were matching so well with the paper manufacturer’s profile meant that I wanted to continue to use it if I could. So far I’ve made prints of about a dozen different images using this method, and opacity settings of either 50% or 25%, depending on the histogram, have worked every time. I’m not sure how widespread this problem might be. A member of the local camera club mentioned he had the same issue, so I’m sure I’m not the only one. It’s certainly an easy fix to try if your prints are looking too dark. NOTE: A Darks-1 mask can be made and applied with either the TKActions V6 RapidMask2 module or the free Basic V6 panel. 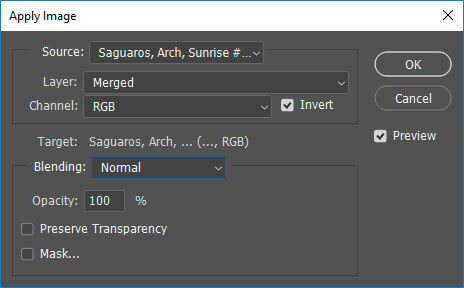 You can also make a Darks-1 layer mask using Photoshop’s Image > Apply Image… menu command using the settings shown below. Be sure to check the “Invert” checkbox in the dialog window to get a Darks-1 mask instead of a Lights-1 mask. Sean Bagshaw recently posted another Quick Tip video covering how to save and reuse luminosity masks. 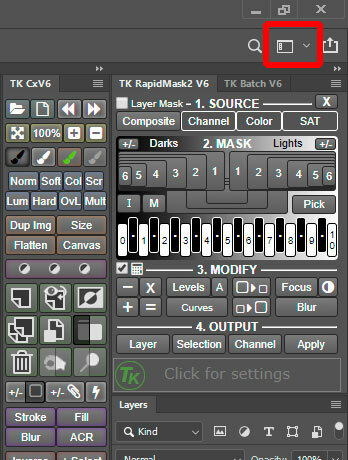 The TKActions V6 panel has the “Channel” button in the OUTPUT section, which saves the luminosity masks it generates, already programmed in. So the saving part is pretty easy. But the panel doesn’t know when you want to actually recover and use the saved mask, and that’s where Sean’s video comes in handy. He’ll walk you through a couple of different methods to add the saved mask to a layer on the Layers panel. Saving and reusing masks on the Channels panel is somewhat of an advanced technique, but it’s helpful to be aware of it for those situations where you’ve spent a little time creating a particularly useful mask that you might want to use again later on. 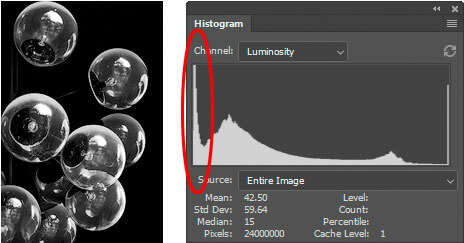 Another option for reusing and duplicating a previous luminosity mask is to use one already deployed as a layer mask on the Layers panel. To reuse a layer mask, simply ALT/option+click on the mask and drag it to the layer where you want to use it. Photoshop will duplicate the mask and add it as the layer mask on the second layer. While this is a relatively easy maneuver, layer masks can sometimes get a little messy if you’ve painted on them to conceal or reveal how the mask affects the layer it’s attached to. Channel masks, like Sean demonstrates in the video, can be used to save an original version of a mask that can then be further altered with painting or other adjustments after it’s turned into a layer mask. I’ve been testing the TKActions V6 panel with the newly released Photoshop CC 2019 on both Mac and Windows computers and everything seems to be working properly. There aren’t any major issues associated with the panel as far as I can tell. However, with every new version of Photoshop some users experience problems and there are almost always new bugs in Photoshop itself. These issues are usually NOT due to the V6 panel, though they can affect its performance. I’ll review a couple of situations below that have been brought to my attention. As some of you might be aware, Photoshop CC 2019 has a major bug. When you open Photoshop by opening an image directly from Lightroom, many functions are grayed-out on the Photoshop menus. This problem appears to be a Windows-only bug. This Photoshop thread discusses it and has an official Adobe recommended workaround. Basically, Windows users need to open Photoshop CC BEFORE opening images from Lightroom. Doing this makes all the functions in the Photoshop menus appropriately available. The V6 panel runs some of these standard Photoshop functions as part of the steps programmed into the panel’s actions. So launching Photoshop CC first insures that these functions are available and can be accessed by the panel. Open Photoshop CC directly from its launch icon on your computer. Do NOT open PS CC by opening an image from Lightroom, Bridge, or ACR. Have Photoshop CC open BEFORE opening any image. Now open an image (by whichever method you prefer). The panel should now work normally and will demonstrate that this an Adobe bug and not an issue with the panel itself. When you install a new version of Photoshop CC, the workspace preferences from the old version usually transfer to the new version including the V6 modules you had open and their placement in your workspace. Unfortunately, sometimes this does not happen and it will look like the V6 modules disappeared and need to be reinstalled. However, re-installation is seldom necessary. Instead, first click the Workspace menu in the upper right corner of Photoshop (red box below) and see if your last workspace is listed there. If it is, click it and it might restore your last workspace including the V6 modules. If that doesn’t work, go to the Window > Extensions menu in Photoshop and click each of the modules you want to open. You might need to reconfigure the modules into your preferred arrangement using the information in Sean Bagshaw’s video. If you don’t see these folders in the “extensions” folder, double-check that you have the correct installation path to the “extensions” folder. It’s unusual that the folders would be removed simply by installing the new version of Photoshop CC. If you’re sure the installation folders are missing, contact me and I’ll reactivate your download link. 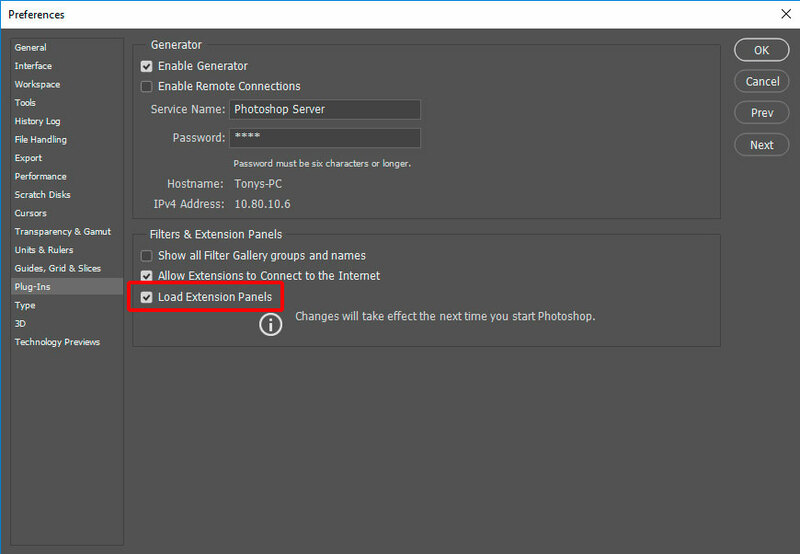 If you see the installation folders in your “extensions” folder, then your V6 panel is properly installed and will show up in the Window > Extension menu of Photoshop CC if your application is working properly. If you don’t see the modules listed in the Windows > Extensions menu, reboot your computer and check again. That’s always something worth doing when things aren’t working properly. Another thing to check if the modules don’t show up under Window > Extensions in Photoshop is the preferences. Go to the Preferences > Plug-ins menu and make sure that “Load Extensions Panels” checkbox is checked. This has been a problem for a couple of people. The checkbox needs to be checked in order for panels like TKActions V6 to show up in the Window > Extensions menu. While the two problems listed above have occurred for a few users, there are also occasionally really weird problems that only happen for one user and can’t be replicated. This is often a sign of corrupted Photoshop preferences files and the only solution is to reset them. This Adobe video shows how to do that. But feel free to check with me first to make sure that I’ve not seen the problem before and have a different recommendation. In a few cases where the above solutions don’t work, uninstalling and reinstalling PS CC is necessary, but that’s rare. Always try rebooting the computer before reinstalling Photoshop as some odd problems can occasionally be solved with a reboot. Please contact me if you notice other problems with the V6 panel and Photoshop CC 2019. My sense is that CC 2019 is quite buggy yet, so there may be other issues yet to be discovered. If I can replicate the problem, I’m usually able to fix it or recommend a workaround. 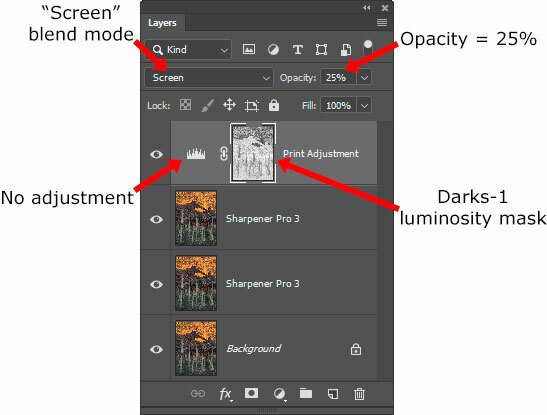 If I hear of other problems with Photoshop that are regularly affecting the panel, I’ll post additional information on this blog. At this time, though, the V6 panel works fine in Photoshop CC 2019 and is available to make luminosity masks when you need them. Sean Bagshaw’s YouTube channel has another great workflow video using the TKActions V6 panel. This one covers developing the Milky Way in a night sky image. He starts in Light Room with what appears to be a somewhat unremarkable image of the Milky Way, but with a few quick adjustments uncovers the potential hiding in the dark tones. I liked the Light Room techniques for adjusting the colors in the RAW file and the way the blue fringe around the stars can be removed. The really good stuff happens when the image is opened in Photoshop as a smart object. Sean selects the Blue channel mask to better target the Milky Way (compared with a standard luminosity mask). He then uses classic luminosity painting to create more dramatic contrast. This involves loading Light and Dark masks as selections and painting white and black through these selections to selectively change image brightness. It’s quick and easy since the selection guides the paint to where it’s needed. For noise reduction, Sean uses the TKActions V6 panel to duplicate the smart object so the noise reduction can be done on a separate layer and later filtered into the image through a luminosity mask. Using the V6 to duplicate smart objects has the advantage of unlinking the duplicate smart object from the original smart object. This is important since Sean reopens the duplicate smart object in Adobe Camera Raw and is able to perform significant noise reduction on it without affecting the original smart object. If the original and duplicate smart objects had not been unlinked, both the original and the duplicate would have been affected the same by the noise reduction in ACR. Instead, by creating an unlinked smart object first, strong noise reduction can be applied to the duplicate smart object to the point of blurring the stars. A luminosity layer mask can then be applied that reveals the noise reduction in the dark areas of this layer while simultaneously preserving the sharp detail of the individual stars from the original conversion. It’s a bit hard to describe in words, but watching Sean do this in the video will make it crystal clear. The final technique is to make the stars even sharper using the “Clarity” action in the V6 panel, again combined with a Blue channel luminosity mask as a layer mask. This is a subtle change but the type of one that makes the final image look its best. The video is just over 21 minutes long, but it seems much shorter. Sean covers a lot of territory with a several really useful techniques facilitated by the V6 panel. The change is quite dramatic and shows what’s possible even when the original RAW file looks marginal. If you’re already doing Milky Way photography or thinking of trying it, this video will give you confidence that you can indeed create a stellar image. Be sure to subscribe to Sean’s YouTube channel for great tips on photography and post-processing including those listed below.